Awesome weekend away at the Kai Iwi Lakes just outside of Dargaville, Northland, New Zealand. 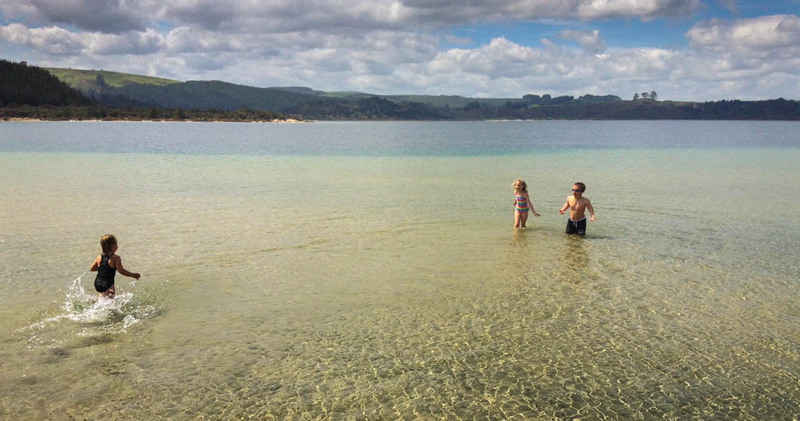 Dream of a place of sheer beauty that was created more than 1.8 million years ago for the delight of kiwi campers, and you have the Kai Iwi Lakes - crystal clear freshwater lakes. Just 30 minutes north of Dargaville, the lakes are part of the Taharoa domain, an unsurpassed recreational reserve. Bring the kids, bring the tent, bring the kayaks, windsurfer, fishing and dive gear, boat and water skis, surf ski and of course your togs. And what an ideal place to swim – these deep dune lakes are rimmed by warm shallow water just made for kids to run and splash or for freshening up after a lazy afternoon in a deck chair poised on the pristine sands with the rippling waters lapping at your feet. Cycling round the lake perimeters or hiking over farmland to the ocean alleviates the guilt of excess from evening gatherings spent with new found friends from adjoining tent sites cooking up a feast from the day’s catch. As well as succulent rainbow trout the lakes are teeming with koura, crabs, freshwater mussels, native and exotic fish. A perfect playground. The Taharoa domain is a 538 ha recreation reserve containing three freshwater lakes known as the Kai Iwi Lakes. It is situated 35km northwest of Dargaville. The domain can be reached by travelling along State Highway 12 to the junction of Omamari Road which is well signposted. It is a further 11km along Omamari Road and then Kai Iwi Lakes Road to the domain. An extensive walking track system has been developed within the reserve. Sheltered camping and picnic facilities are also available for visitors to the area. The Taharoa Domain is 2.5 km from the Tasman Sea. Walkway access to the coast is available though an adjoining farm property west of the domain. The nearest road access to the coast is at Omamari 8km to the south. Dogs are not permitted in the domain. like beauty and clear waters.